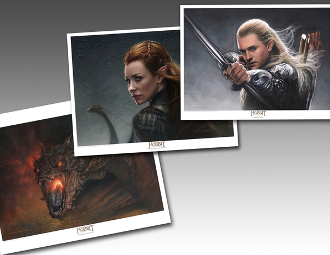 Smaug Legolas and Tauriel appeared in The Hobbit: The Desolation of Smaug and now they are available in this three piece lithograph set! Enjoy the savings you get with these smaller, bargain-priced Lithographs as a set. These Paper Lithographs are bargain-priced using a four color process, utilizing archival inks on McCoy Silk cover paper and aqueous coating sealer. Outer paper dimensions measure 16 x 20 inches. Each lithograph comes signed by the artist with Certificate of Authenticity. We ship all over the world. International buyers are responsible for any import fees, or taxes that may apply. Please incude a phone number.